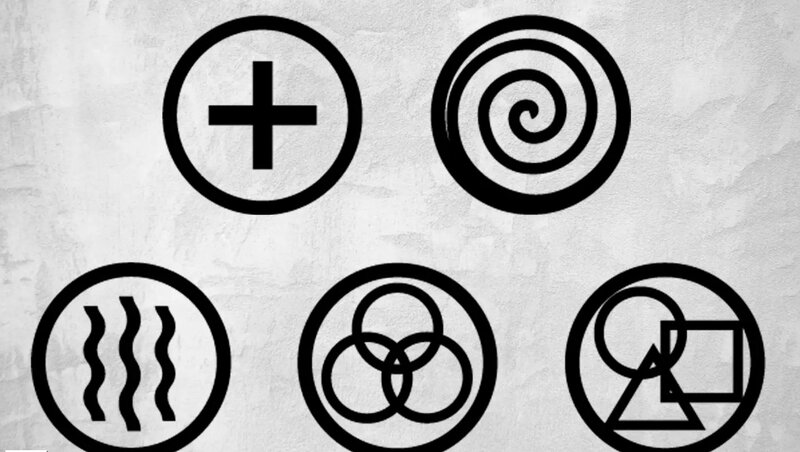 In our last blog, I introduced Integral Theory, a meta-theory by Ken Wilber. His AQAL model and acronym include five elements: (four) quadrants, levels, lines, states, and types. 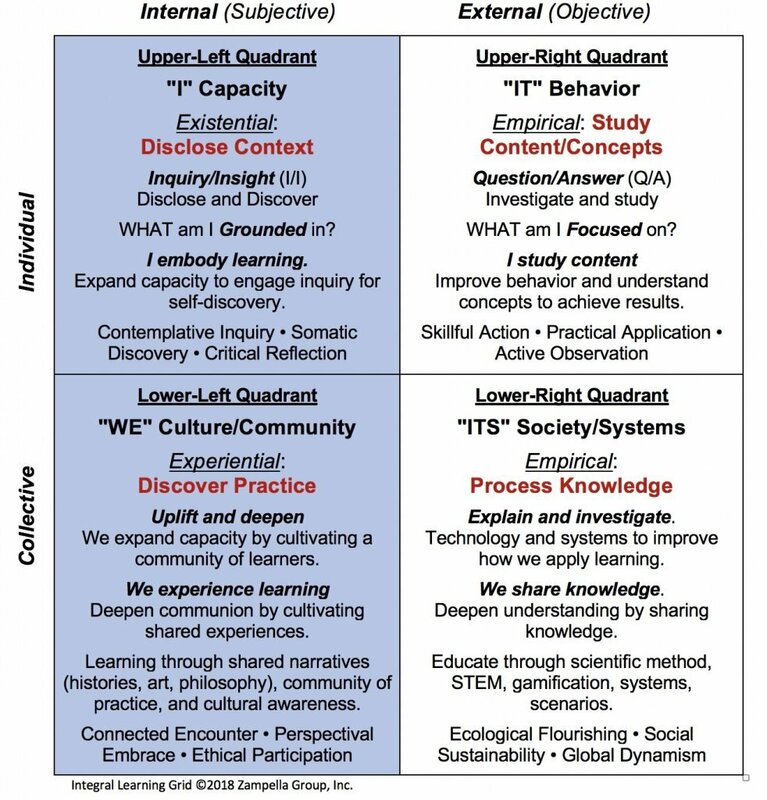 As detailed in that last blog, each quadrant focuses our attention to observe and influence modes of inquiry. 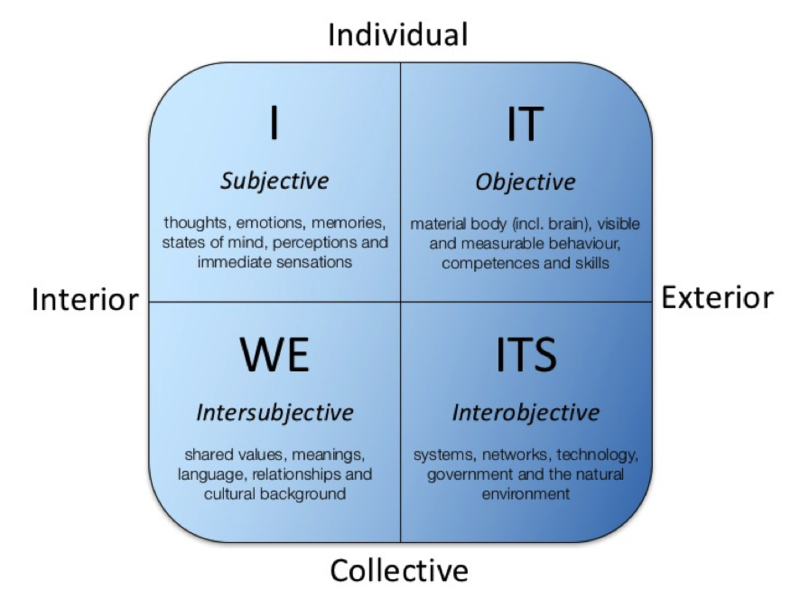 This blog further distinguishes the Quadrants of Integral Theory and applies it to Learning and Leadership: two areas of development that impact organizational life today that might benefit from an integral perceptive. Quadrants: The four quadrants are four perspectives that all phenomenon possess. Levels involve stage development, offering mindsets or vertical development, embracing previous levels to expand and include more variables and complexity. Lines of development are akin to Gardner’s multiple intelligences, expanding each line across each level. States (of consciousness) unfold within deep awareness that is both more fluid that evolve through stages of “awakening,” from gross, subtle and causal to non-dual awareness. Types involve from basic such as gender to more complex personalities typologies such as Meyers-Briggs, Keirsey, and Enneagrams, etc. For Wilber, reality — all phenomenon — is not composed of things or processes, but of holons, which are wholes that are simultaneously parts of other wholes (whole/parts). This is true in the way a word is both, whole, onto itself, and part of a sentence; and that, a sentence is also whole, and part of a paragraph, and so on. The four quadrants reveal four dimensions of a holon (whole/part) when observing phenomenon and solutions. … that form the culture (lower left) and drive actions (upper right). Disney canceled the popular show Rosanne within hours of a racist tweet by its star, Roseanne Barr—not for low performance, ratings, or revenues (right side), but for racist remarks (left side) made in another venue. In recent weeks, five airlines sacrificed profit to stand against the U.S. government’s family separation policy. Each refused to transport separated, undocumented minors across our nation. Last year, the former CEO and co-founder of Uber, Travis Kalanick, was summarily dismissed and replaced by his board for fostering a culture that revealed sexist policies. Each of these situations resulted not from poor revenue, bad ratings, low profit or lack of productivity. These right-side issues were trumped by left-side values and concerns, catching boardrooms and executives off-guard. This blog further distinguishes the Quadrants of Integral Theory and applies it to Learning and Leadership. Learning can be most pernicious, as most educational institutions have designed learning from the right-side perspective of studying, teaching, and investigating. That perspective limits us to facts and evidence from empirical observations, which in business translates to researching, acquiring and managing knowledge. But knowledge is more fungible and accessible now than ever before. We require a framework that expands beyond knowing to increase capacity in learning. Researcher Sean Esbjörn-Hargens, a leading scholar in integral education, shares thoughts in his paper Integral Teacher, Integral Students, Integral Classroom: Applying Integral Theory to Education, which explores the strength each quadrant contributes to an integral learning experience. This quadrant increases capacity. I embody learning and self-discovery through inquiry. Through increased awareness, I engage in contemplative inquiry, critical reflection, and somatic discovery. The focus is on whether I am grounded: open to possibility, now, and present to my intention? Or, am I reacting to the past or anticipating the future? This quadrant studies content. I study concepts and research knowledge to produce results. Through study, I engage in skillful action, practical application, and active observation. The focus is on whether I am focused on distractions or study. This quadrant discovers practices. We experience learning via deepening and uplifting engagements. Through discovery, we understand through connected encounters, perspectival embrace, and ethical participation. We experience learning by cultivating shared experiences to clarify values and deepen shared commitment. This quadrant processes knowledge. Technology and systems can improve how we learn together via efforts such as STEM, gamification, systems, and scenarios. We share knowledge through connections enabled by processes, systems, and technology. AQAL Model to distinguish Integral Learning. Learning challenges that emerge often do so from confusion between left- and right-side observations and solutions. We tend to notice the emergence of right-side issues and assume they require right-side solutions. For instance, if students drop out of school or if employees lack competency, we tend to seek out content, tools, or systems to solve these issues. This is automatic because we are inclined toward progress; we constantly feel the need for new tools, better content, or bigger systems. When developing learning programs or working with learning specialists, we automatically lean toward these right-side solutions. Many of them involve STEM, empirical, and practical solutions that manage conditions at the expense of left-side phenomena and discoveries that involve values and practices that deepen culture. As a guiding principle, the right side explores tools to improve behavior and systems that increase productivity, and the left side explores values that cultivate belonging and practices that deepen culture. The key here is to include right-side learning grounded in empirical investigations (what we research, study, and know) and left-side learning that encompasses both experiential observations (what we generate and discover) and existential inquiry (who I am, why this matters). The inquiry into learning also impacts how we view leading, leaders, and leadership. Expanding or developing these capabilities involves challenging observations, discoveries, and solutions precisely because most experts, executives, and learning specialists focus on the right-side perspective, limiting us to facts and evidence from empirical observations. 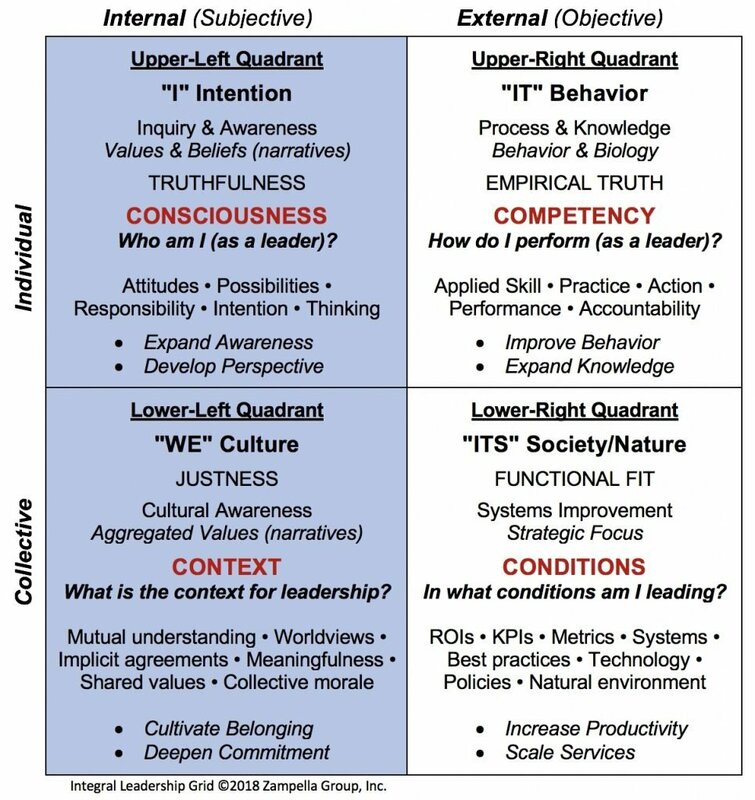 Researcher Russ Volckmann, the publisher and editor of Integral Leadership Review, explores the strength each quadrant contributes to an integral learning experience. This quadrant discloses consciousness or levels of awareness. Interventions address who I am (as a leader) by questioning values and beliefs and inquiring into attitudes, possibilities, intention, and thinking. With practice, I expand awareness to develop perspective. This quadrant improves competency. Interventions address how I perform (as a leader) by expanding skills and improving actions, performance, and accountability. With training, I improve behavior and expand knowledge. This quadrant discovers context. Interventions address developing cultural awareness that involves exploring implicit agreements, shared values, worldviews, and collective morale. By encouraging aggregate values and shared practices, we cultivate belonging and deepen commitment. This quadrant manages conditions. Here, interventions involve technology and systems to manage, share, and enhance knowledge that improves best practices and strategic focus. By managing systems and resources, we increase productivity and scale services. AQAL Model to distinguish Integral Leadership. When examining the needs of organizational life, we view the lower half of the quadrants as most business executives do: relying solely on lower-right solutions. They understand success through measures such as behavior modification via skills and technology to increase performance (ROI, KPIs, and productivity measures). Leaders often diagnose a lack of team cohesion by focusing on skills to become productive (right side) rather than on a culture that promotes belonging or collaboration (left side). Leadership development often focuses on achieving tasks, projects, and goals (right side) while ignoring demands to promote a culture of meaning and purpose (left side) that courses through an organization. The dilemma for developing leaders and cultivating leadership development resides in all four quadrants. Leadership involves the role (leader), the behaviors and worldviews—including beliefs, intentions, and the like—(leading), and the context (systems and culture). In a world of fungible knowledge, volatile change, and increasing complexity and ambiguity, leadership ventures beyond Hersey’s and Blanchard’s (1969) notions of situations and situational contexts. An integral context includes awareness and culture as well as systems, processes, technologies, and so on. Thus, the term leadership refers to the gestalt of bio-psycho-social-cultural-spiritual phenomena in which many variables are played out in the service of generating or altering contexts for some accomplishment, even if that involves creating a calm presence in the face of challenges. Leadership development today expands our view beyond the right side, to involve the upper left “awareness” view, to cultivate the lower left “context” view, to expand culture by deepening belonging and commitment. Much of our work to expand human potential and to develop leaders and leadership require new views of humans, organizational life, and change. Integral theory and the AQAL model comprise more than the four quadrants—to include levels, lines, states, and types—but there’s no place better to begin. Expanding our view beyond the right side is a worthy effort to open to wholeness in everyday life. Typically, with my blog posts, I share thoughts and ideas about learning and leadership without tying them back to our firm. I will just make this rare point. Our firm employs an Ontological Inquiry with Integral Theory and Contemplative Practice for the sole purpose of working with coaches, L&D professionals, and executives to expand mindsets to include the left side of the AQAL model. We’ve engaged in this level of development because of the times we find ourselves. Today, adult learning must achieve more than mere training for competencies. We must create a meta-learning framework that allows for expanding awareness, integrating new insights and complexities, and engaging practices that sustain continuous learning. Tony Zampella is the learning designer at Bhavana Learning Group (previously, Zampella Group), which serves coaches, learning professionals and business executives. As an instructor, researcher, and designer of contemplative learning programs and practices, his work develops mindsets for growing a culture of servant leaders. and, Zen Buddhism to sustain contemplative practice.